Reboot, and there you have it! John, hypothetically speaking, if one were to be assisting someone else with a switch to custom firmware, and not check to see that we had the correct .rom file to flash, would it be possible to use a Bus Pirate to resurrect this particular device? As it stands now, the device is completely borked. No activity of any kind through any ports at all on powerup. I see a picture on one of your posts where you have this same motherboard connected to what appears to be an SOIC clip of some kind attached to the IC near the battery on the underside of the motherboard. (https://johnlewis.ie/wp-content/uploads/2013/10/IMG_20131023_134258-1.jpg) Any insights and opinions regarding this process would be very much appreciated. What device have you got, and what ROM did you flash? It may not be completely bricked, just the display. Why didn’t you use the script to automatically determine and download the best version for you? Device is the HP Pavilion 14 Chromebook (Butterfly). 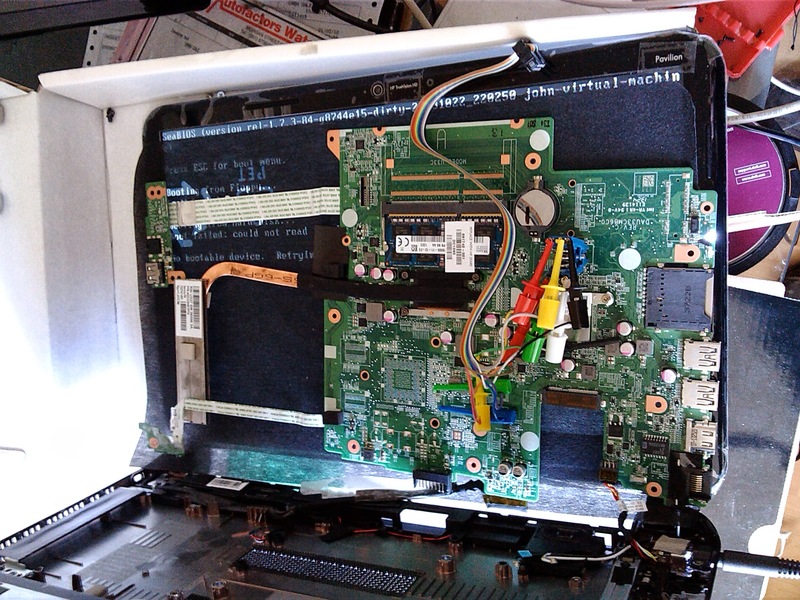 Rom flashed was the version for the HP Chromebook 14. Device seems to be completely bricked, as far as I can tell. USB drives inserted into all ports show no signs of being powered. Black screen, device is “on” as long as the battery is inserted and the lid is open. We didn’t use the script, because we were working on it in an area without an active internet connection. The rom was already on a thumbdrive. Yes, I know. We should have just waited and used the script. Also, Flashrom would’ve warned you when you tried to flash a ROM with a different product name in, and you must’ve used the “force” option. Just goes to show you shouldn’t always use the force (Luke). The guide to unbricking the 550 is relevant for the HP Pavilion Chromebook also, only difference is the location of the SPI chip, which you can see in https://johnlewis.ie/working-coreboot-on-hp-pavilion-14-chromebook-aka-butterfly/ You’ll have to unscrew the motherboard and flip it as it’s on the underside. If you notice that the pin assignment I’m using with in the picture is different, it’s because I have a Dediprog SF100 (kindly donated by Google) which is a faster, but 5 times more expensive alternative to the Bus Pirate. Happy unbricking! Your method works just fine on ubuntu but not on elementary os, I’m very attached to oes, do you know how to make the touchpad works on it ? I have a HP Pavilion 14-c001ef14. Considering Elementary OS is based on Ubuntu it “should” work. You’d be quicker to ask on the Elementary OS forums. I take it you did reboot? Also can you check /etc/rc.local has the executable bit set “x”? You should probably point them at this post so they see what you’re trying to do, and how it might need to be tweaked for their setup. I did your manip several times on ubuntu, xubuntu and even on the latest beta of elementary os (freya), it’s always works ! If you have to create the file you need to make it executable “chmod +x rc.local” and remember to put “#!/bin/sh” at the start, or it won’t work either. This article is for the HP Pavilion Chromebook, aka Butterfly *not* Falco. To get the touchpad working on Falco, you need *either* one of the distro specific scripts to compile the correct modules *or* to download and compile a 3.17 release candidate kernel (I’m doing the latter with CentOS 7 now for the last few months, and it’s rock-solid). Unfortunately didn’t work for me. Now my cursor just disappears when I move the touchpad. Even if I use synergy to use my other mouse, it is an invisible cursor. Plugging in a mouse and unplugging it brings the cursor back. Please confirm the cyapa module is loaded with “lsmod |grep cyapa”? Thanks for all of your work! I recently flashed your ROM on my Samsung Series 5 chromebook. Everything went well except that the trackpad and bluetooth are not currently working. I went through all of your posts on here, and other than the FAQ section mentioning grounding the trackpad I haven’t seen something specific to the Samsung Series 5. If you could steer me in the right direction that would be great, if not that’s fine too! Thanks. I think you must mean the Series 5 550 *not* the Series 5, as they have completely different hardware, and the latter is not mutually compatible with any of my ROM’s. I need a little more context here. Which distro are you trying to get working? Thank you for the work on chromebooks, I’ve wanted to ‘upgrade’ my HP 14 for years, I finally got it done. I’ve installed Xubuntu 17.10, and..
still no touchpad. :( I’m googling, but I thought I might ping an old thread for new advice. Is it the HP Pavilion Chromebook or the HP Chromebook 14 though? This article wouldn’t be relevant to the latter, but what’s possible is that the sensitivity is set so low by default that the pad doesn’t “appear” to work, but if you use the click buttons or press really hard when moving your finger on the pad, it will work. Is that the case with you?